Camping is an outdoorsy tradition where participants experience living in nature for a limited period of time. It first became popular as a recreational activity during the early 20th century. "Campers" will usually spend anywhere from one night to a week or two living at a "campsite," participating in outdoor activities and enjoying wildlife. Campers can pay to rent a piece of publicly owned territory or camp at a state or national park. There are even places called "campgrounds" that cater to nature-lovers by providing them with a specific part of the park, some organized activities or meals, and public restrooms and recreational facilities, in case the campers do not want to live completely in nature. Campers will often bring their own tent to sleep in, and some campgrounds provide lean-tos or some form of limited shelter. Some adventurous campers will even sleep on the ground in sleeping bags with no covering at all. This way you can truly "sleep under the stars" and experience nature at night. Camping is a fun activity to do with family or friends. There is a lot to learn in terms of how to survive in the wild and have fun without modern appliances, technology and other luxuries. Camping is often used to teach things like survival skills or teamwork and teambuilding. While camping, you can spend extended time bonding with friends face-to-face, doing things like telling scary stories or going fishing or hiking. Another draw is that it makes for a nice break from reality and the chaos of city life. 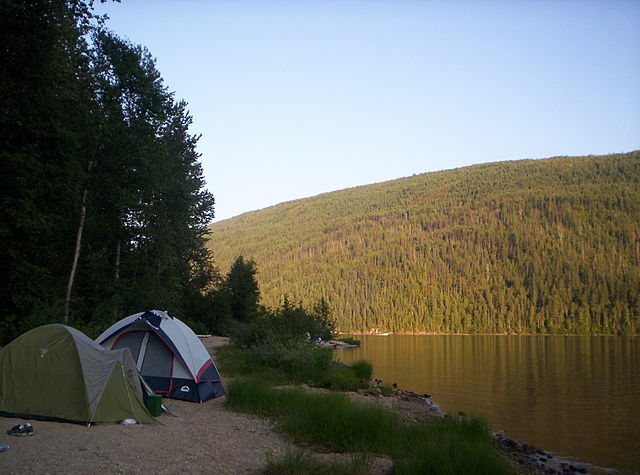 A lot of campgrounds are on lakes, in which case you can go swimming, fishing, boating or just lie out in the sand, relax and have a good time. Another fun aspect of camping is grilling food or cooking dinner over a campfire. Many Americans will bring traditional American foods, like hot dogs and hamburgers, to grill or cook over a fire. Very rustic campers will even cook the fish that they catch for dinner! Other common camping foods are non-perishable items such as peanut butter and jelly sandwiches or chips. Multiple changes of clothes, because you will get dirty! Particularly if you have a campfire or use a grill, make sure it is put out before you go to bed at night. Camping is one of the major causes of forest fires. Be extremely careful when cooking over a fire as not to burn yourself. Even if the fire is put out, the coals and wood will still be extremely hot. It is also important to follow any signs or advice regarding where and when you may build fires, as most parks and camp areas may have certain times of year (particularly in the driest time of summer) where it is not permitted to build fires. You should also never approach wild animals. Usually they are more afraid of humans than humans are of them and will run away, but you should still never try to touch or feed them. Ensure your food is closed up tightly, and always bring a secure bag that you can hang up outside your tent with any food or other sweet-smelling items. It is better for critters to try to get into your bag outside of your tent rather than trying to come into your tent to get it. Never go hiking alone; make sure to take a buddy with you and always be aware of your surroundings. It is also a great idea to give a friend or your host employer details regarding where you will be traveling in the event of any emergency. Finally, always be sure to check weather forecasts before heading out for a camping trip. You should never go camping in extreme weather or in thunderstorms. Camping should be fun, but it is most important that you stay safe! Have you ever been camping? What's your favorite part about camping and what other tips would you add? The Ultimate Camping Guide: Search for campgrounds by state!